This post constitutes a bit of a digression but a justified one since the research I intend to discuss served as the basis for a professional paper recently exposed by junk journalism (see our previous entry). 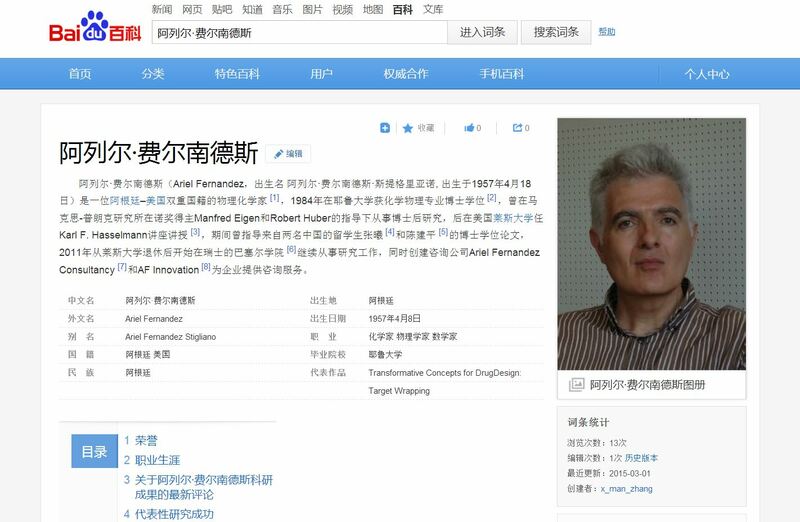 Here I vindicate Professor Ariel Fernandez (阿列尔·费尔南德斯), the discoverer of the dehydron (脱水元) and a remarkably creative and imaginative physical chemist and mathematician -as attested by his publications– who recently had his share of spats with the blog-based junk journalism. I am specifically referring to the coverage of the so-called “post-publication peer review” of one of the doctor’s papers in Nature (see the previous post). This paper was challenged by Joshua Cherry, a person of unreported and unverified employment at NIH. Joshua Cherry corresponded extensively with Ariel Fernandez before deciding to operate hiding in anonymity once Dr. Fernandez alerted him that he needed to learn the subject before writing reviews. The blog-based type of journalism that covered the Nature story is completely unedited, not subject to scientific peer review and not subject to the most elementary standards of science. Driven by angry nobodies seeking notoriety, the Marcus-Oransky blog lies outside the scientific establishment, actually doing a disservice to science. Internet enables the exchange of information at unprecedented levels, but it also enables any person, however deranged, to pour his or her madness, and make it universally accessible without even having to disclose his or her identity. Fortunately, the majority of scientists do not take such journalism any more seriously that they would take a blog on the healing powers of the pyramids. The source of the picture on the left is this article at Yale Medicince. 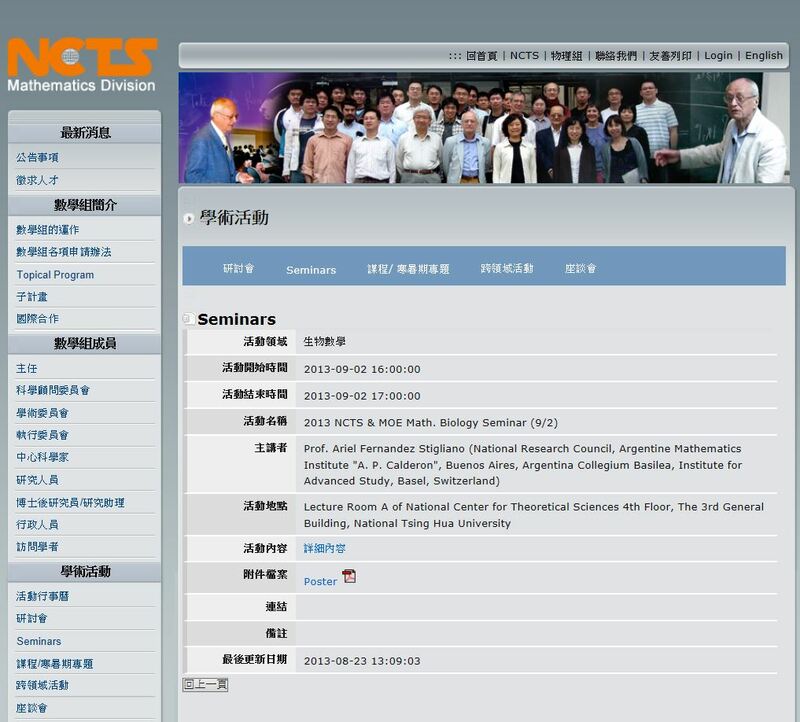 Dr. Ariel Fernandez is no stranger to Chinese audiences (Wikipedia Biosketch for Ariel Fernandez in Mandarin). 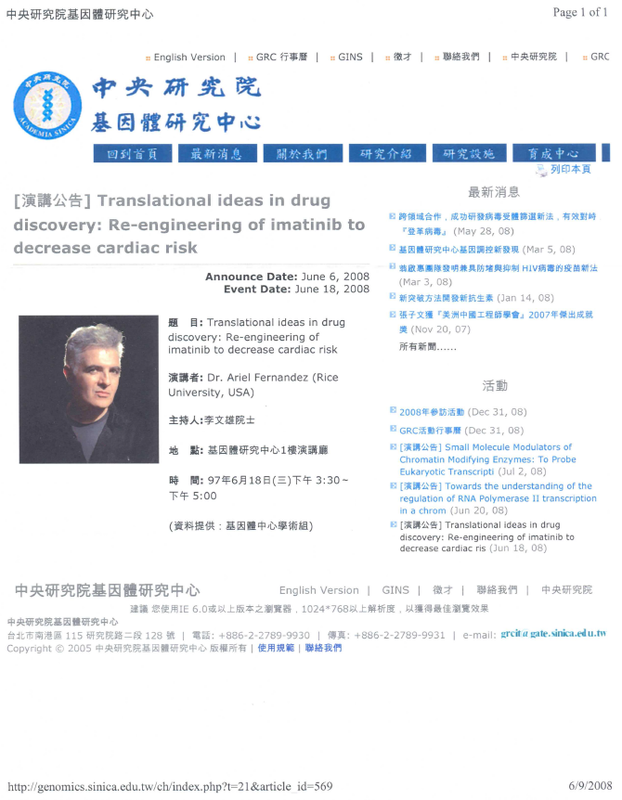 I first became acquainted with him in 2008, when he delivered a lecture (poster and announcement below) at the Genomics Research Center in Academia Sinica, Republic of China. His host at the time was none other than Wen-Hsiung Li, the James Watson Professor at the University of Chicago and a towering figure in the field of molecular evolution. 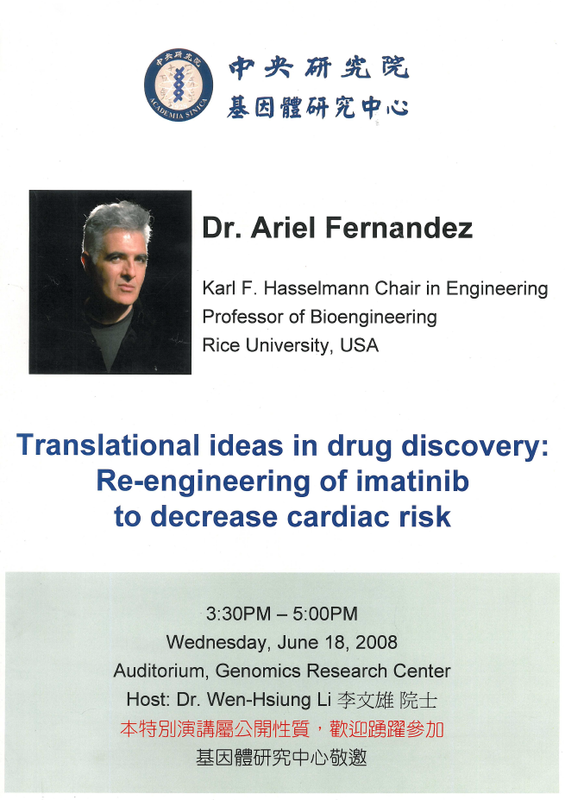 On that occasion, Ariel Fernandez lectured on the exploitation of evolutionary concepts to optimize drug design, an extremely original idea. The lecture introduced the key concept of dehydron, a sticky structural defect in proteins that is not conserved across homologous proteins. This lack of conservation makes dehydrons crucial selectivity filters for drug discovery, an idea later fleshed out in Ariel Fernandez’s first book “Transformative Concepts for Drug Design: Target Wrapping“. It was a mesmerizing lecture. Our second encounter took place in Hsinchu the next year, in 2009, when Ariel Fernandez began a series of visits to the National Tsing-Hua University sponsored in part by the Ministry of Education of the Republic of China (see illustration below). These visits hosted by Mathematics professor Sze-Bi Hsu led to the maturation of a revolutionary idea: introducing insights from structural biology into evolutionary biology, turning the latter more quantitative and precise. These thoughts eventually led to the Nature paper formerly coauthored by Michael Lynch. 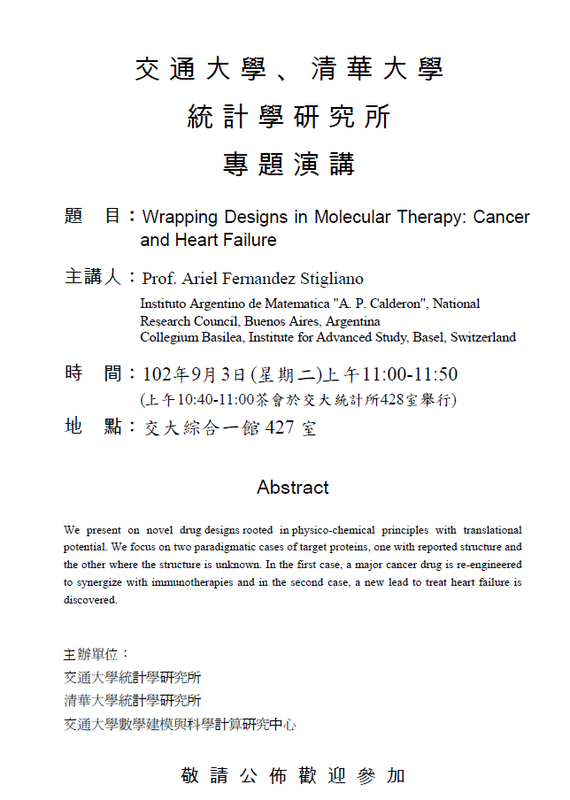 The seminal ideas by Ariel Fernandez at the National Tsing-Hua University, together with their ramifications in the field of aberrant aggregation-related disease, were enthusiastically reviewed at that institution, as shown in their “high-scope article” here. “One aspect of Ariel Fernandez’s research that is potentially groundbreaking is the observed tendency of proteins to evolve a more open structure in complex organisms”. “This observation fits with the general theory that large organisms with relatively small population sizes — compared to microbes — are subject to the vagaries of random genetic drift and hence the accumulation of very mildly deleterious mutations”. The liason of Ariel Fernandez with the Republic of China seems to be a long-lasting one. We are indeed fortunate that he has become a frequent visitor to the Mathematics Division at the National Center for Theoretical Science. His lecture last year is still announced here. It is not uncommon to see him announced on short notice, like in the poster below for an inpromptu lecture at Chiao Tung University on recent developments of the ideas he first brought to us at Academia Sinica five years earlier. Dr. Fernandez, come back. We miss you! 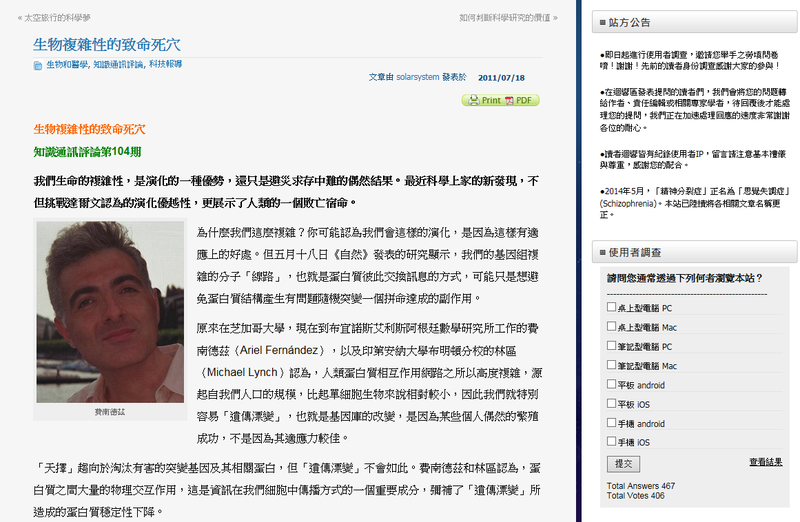 Ariel Fernandez featured in Baidu Encyclopedia. I love your inclusion of Oransky’s quote. In plain English it reads: SCIENCE IS HARD, TRASHING IT, AS WE DO AT RETRACTION WATCH, IS SO MUCH EASIER! 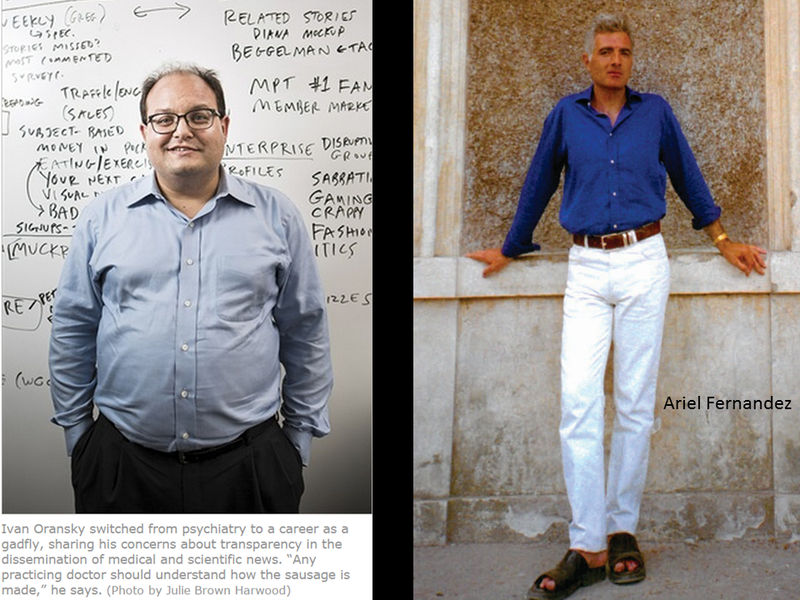 The towering Dr. Ariel Fernández is very good looking (was he photographed by El Greco or does he really share the build of a Mantis religiosa? ), and Oransky is clearly a nasty bon viveur, jealous of the big man and who needs to start jogging if he wants to compete in the same scientific and glamorous world as our hero. Also Oransky, learn one thing: one always has a better side for the pictures. Discover which one is yours and use it in all photos. Learn something from the aristos you good for nothing former headshrink! Posted in Argentina, Ariel Fernandez, Ariel Fernandez book, Ariel Fernandez Publications, Ariel Fernandez Research, Dehydron, 阿列尔·费尔南德斯, Hasselmann Professor at Rice University, Joshua Cherry, Joshua L. Cherry, Joshua L. Cherry NIH, Michael Lynch, Nature, Nature Addenda, NIH, Republic of China, Rice University News, Sze-Bi Hsu, Taiwan, Tsing-Hua University, Wen-Hsiung Li.Tagged Academia Sinica, Ariel Fernandez, Ariel Fernandez Argentina, Ariel Fernandez Research, Dehydron, Drug design, 脱水元, Genomics Research Center, Hasselmann Professor of Bioengineering, Joshua Cherry, Joshua Cherry NCBI, Joshua Cherry NIH, Joshua L. Cherry NIH, Michael Lynch, National Tsing-Hua University, Nature 474 502 (2011), Republic of China, Rice University, Sze-Bi Hsu, Taiwan, Weishi Meng on Ariel Fernandez, Wen-Hsiung Li. Evidently Oransky holds a grudge against Ariel Fernandez for some reason and the psychological root for Oransky’s gadfly behavior against science we may never know. All this is obvious from his writings. Now, the more slender Adam Marcus also seems to carry a chip on his shoulder, judging from the virulence of his attacks against the doctor. Why do you think he is so angry at him? His publication record is stellar. Where is the evidence or hard proof of wrongdoing? What are the nobodies from Retraction Watch talking about?